Posted: Monday 12th May 2014 in eCommerce Technology, Events and Awards, News, Thought Leadership. This week a small team from Summit are attending the annual Magento Imagine conference in Las Vegas to hear all about the latest developments with the platform and the extensive network of partners that support it. While we’re there we’ll be busy sharing ideas, gathering insight and building partnerships with the innovators. We’ll be spending the few days with other industry experts discussing new technologies and strategies in the constantly evolving online world, and bringing this knowledge back with us to help continue our work with retailers to help them get the best from Magento Enterprise. We’ll be hearing more about the future roadmap for Magento and in particular Magento 2. This keenly awaited development is set to include an array of new features, improved functionality and significant improvements to speed and performance. In the meantime we expect there to be a release of version 1.14 of the Enterprise edition. This should include a timescale for the release, the features and enhancements it will include and how this will benefit the vast number of retailers already using the Enterprise edition. Who will we hear from? Roy Rubin, Co-Founder & COO of Magento. Roy will be taking us through his vision for Magento both short and long term to ensure that customers and Gold Partners like Summit are empowered to grow their businesses using the Magento platform. 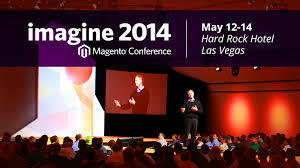 Paul Boisvert, Director of Product Management at Magento will present an update for the much anticipated Magento 2 . We’re also treated to some great keynote speakers with Malcolm Gladwell, best selling author of titles such as The Tipping Point and more recently David and Goliath and extream adventurer and storyteller Jamie Clarke. In between the Magento presentations and keynote speakers there are various breakout sessions presented by Magento partners and merchants. These sessions are designed to share best practice in various areas of eCommerce from email marketing to hosting and design. We’ll be sharing news and pictures from Imagine daily with all the latest updates on the Magento platform so follow us on Twitter, check out blog or subscribe to our YouTube channel. Summit are Magento Gold partners and have been building beautiful and high performing eCommerce platforms since 2006 using our enhanced version of the Magento Enterprise 1.13 platform. If you’d like to know more about how we can help you get more from Magento please contact Chris Dickson on 0203 428 5300.